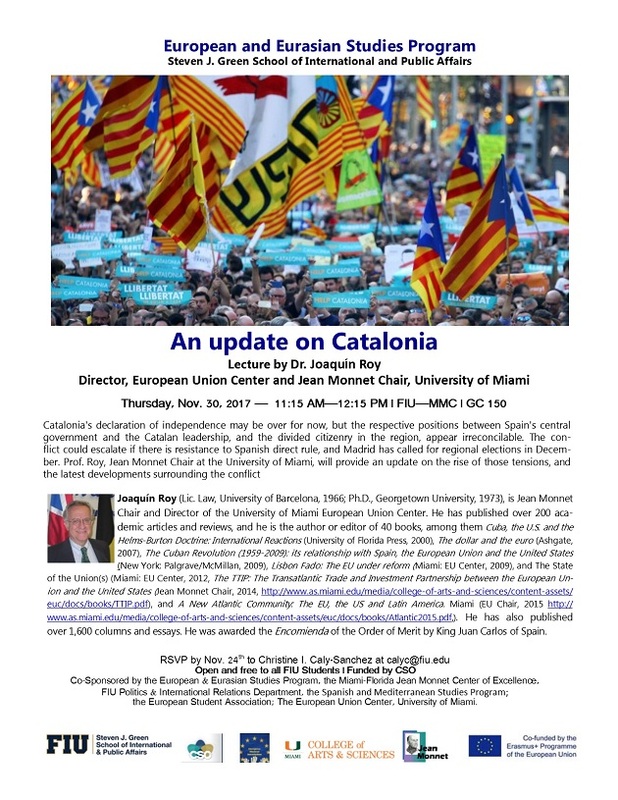 Lecture on "An update on Catalonia" by Dr. Joaquin Roy, Director, European Union Center and Jean Monnet Chair, University of Miami. Catalonia's declaration of independence may be over for now, but the respective positions between Spain's central government and the Catalan leadership, and the divided citizenry in the region, appear irreconcilable. The conflict could escalate if there is resistance to Spanish direct rule, and Madrid has called for regional elections in December. Prof. Roy, Jean Monnet Chair at the University of Miami, will provide an update on the rise of those tensions, and the latest developments surrounding the conflict. Joaquín Roy Joaquín Roy (Lic. Law, University of Barcelona, 1966; Ph.D, Georgetown University, 1973), is Jean Monnet Chair and Director of the University of Miami European Union Center. He has published over 200 academic articles and reviews, and he is the author or editor of 40 books, among them Cuba, the U.S. and the Helms-Burton Doctrine: International Reactions (University of Florida Press, 2000), The dollar and the euro (Ashgate, 2007), The Cuban Revolution (1959-2009): its relationship with Spain, the European Union and the United States (New York: Palgrave/McMillan, 2009), Lisbon Fado: The EU under reform (Miami: EU Center, 2009), and The State of the Union(s) (Miami: EU Center, 2012, The TTIP: The Transatlantic Trade and Investment Partnership between the European Union and the United States (Jean Monnet Chair, 2014, http:/www.as.miami.edumedia/college-of-arts-and-sciences/content-assets/euc/docs/books/TTIP.pdf), and A New Atlantic Community: The EU, the US and Latin America. Miami (EU Chair, 2015 http:/www.as.miami.edumedia/college-of-arts-and-sciences/content-assets/euc/docs/books/Atlantic2015.pdf,). He has also published over 1,600 columns and essays. He was awarded the Encomienda of the Order of Merit by King Juan Carlos of Spain.